Have you been noticing all the recipes for Golden Milk lately? I hadn't made it myself because most recipes contain a good amount of high fat coconut milk and/or sugar. These aren't ingredients I'm going to consume everyday which is why I hadn't made the drink myself, until recently! A friend of mine introduced me to reductarian.org which is a website all about reducing our meat intake. I was perusing the recipes and found one for a Turmeric Latte that only used almond milk and honey! I decided to try out the recipe and I was impressed! I went to the store and got myself some fresh ginger and I've been making it since! I want another cup RIGHT NOW! I like the idea of lattes. I like the idea of eating ginger and turmeric everyday. I like the idea of a pre-breakfast snack. Basically put, I like this! 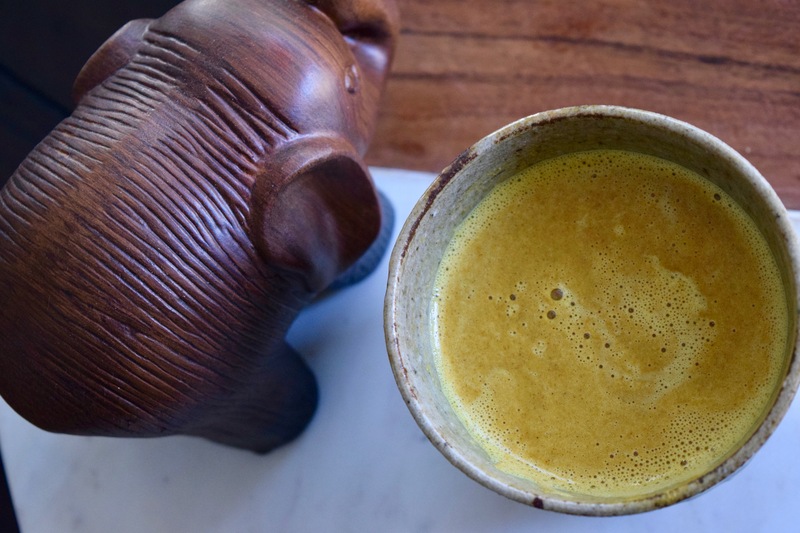 I tried the Turmeric Latte with maple syrup the first morning and it was yummy but then used dates and found it equally good (I like to use whole foods whenever possible). The ginger slightly burns your throat in a medicinal sort of way, which I'm used to since we eat A LOT of ginger when we're sick (you could always reduce the ginger to your personal preference). Most people know that ginger and turmeric are really good for you and it's recommended that you eat some everyday! Ginger is known to help with cramps, nausea, pain relief, IBS, migraines, viral infections, etc. Turmeric is known to be beneficial for things like inflammation, cancer, lupus, pre-diabetes, IBS, etc. Have you tried eating either spice plain? Not so good on their own, but they enhance foods in delicious ways! If you're wanting a hot drink but don't want that nasty sugar-coating left on your tongue (after drinking a Starbucks) or maybe you don't want to spend 37 dollars at the local cafe (Lego Movie?) or maybe you're not into the caffeine buzz well then, try out this Turmeric Latte and get your turmeric/ginger game on! Add all ingredients to a high-powered blender and blend until smooth. If using a Vitamix then blend for an additional 3-4 minutes or until HOT! Pour into mugs and serve hot. If not using a high powered blender then blend until smooth and transfer lattes to a pot to heat over the stove using medium-low heat. Stir until liquid is hot. Pour into mugs and serve hot. If you still want the latte to be frothy then after heating over the stove add the liquid back to your blender and blend until achieved frothiness. Pour into mugs and serve hot. Add a dash of cinnamon to the top if desired. Side Note: I love making my own vanilla almond cashew milk for this recipe! So rich, sweet and creamy and it is really easy to make!